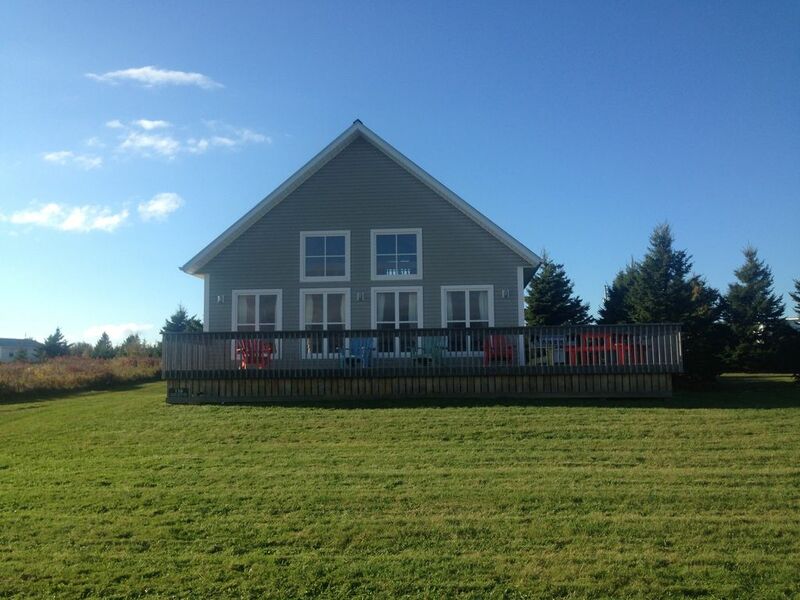 Beautiful new house at Thunder Cove Darnley PEI's most sought after beach. If your tired of dated, ill equipped beach houses come stay in our brand new house and enjoy a modern open concept with all new furniture and supplies to make your vacation a great one. The house sleeps 8 total with four bedrooms and two full baths. We have a large kitchen that is fully equipped. We also have a huge deck with grill, tables, Adirondack chairs and more. If you're a golfer there are seven golf courses within 5-30 minutes from our house.We are a non smoking house also we cannot except RV's of any kind or size. This is strictly a non-smoking cottage - no exceptions. We also cannot have any RV's, campers,trailers or motor homes of any kind. great location and this home had everything that we needed. agreat beach is close by for walking. very nice home-well cared for.this home had a well equipped kitchen, living room and two bathrooms and 4 bedrooms, plus sleeping areas in the living area, if needed. the owner answered any questions that we had very promptly--and the caretaker responded accordingly. our only problem, was the bar across the frame of the bunk beds--this was a bit uncomfortable for sleeping--but probably would be okay for kids. we enjoyed our week, here very much.-thanks again chris! The house is great and nicely situated centrally on the island. Plenty of room inside and out with tons of green space surrounding you and there is a big deck to watch the sunrise from. The house truly was everything we needed and more for a great stay. Thunder Cove Beach and the teapot rock are beautiful and only a 15 minute walk from the house. If you are going to find the teapot, head left down the beach towards the rocks and either scamper up the rocks at the end (if you are feeling spry) to the top and walk along the top off the cliffs and then climb back down to the teapot, or if the tide is low and you don't mind getting your feet wet (ankle deep), then just walk around the end of the rocks being careful you don't slip. I'd be remiss without mentioning the road to the cottage as it barely qualifies as a road. We certainly didn't have any trouble getting down it with our crossover, but it is very rough, so don't bother renting the sports car. Patricia J.Where do you live? Wonderful place to stay in terms of quiet, location (Thunder Cove Beach a few minutes away is the best beach we visited), and kitchen and house generally well-equipped. Owner is on top of things...we contacted him about something and got back to us right away! Loved having the outdoor chairs. A couple of portable beach chairs would have been nice, too. Thank you...most enjoyable! Clean and perfect for families! Overall had a great time staying at this property ! I wished it had some ocean views but other than that it was still nice and close to the beach ! The kitchen is great — the only thing they don’t have is lobster crackers so make sure to get those. We enjoyed the Cabot beach which was close by and ate at the oyster barn which was amazing and the ship to shore restaurant was pretty good too ! It really is a nice part of the province. Not far from cavendish and only an hour to Charlottetown. They do need new beds for sure. Especially in the two queen beds. They are pretty bad .. the upstairs ones you can feel the dents in the mattress from so many people sleeping in it. Thanks so much for the nice response. We are having two new mattresses delivered in September. I'm sorry you didn't get to benefit from these but all new travelers after mid September will. Thanks again for staying in one of my PEI homes. Now the best part...,you are mere steps from a beautiful family beach. The local Islanders are incredibly nice and genuinely helpful. Local seafood is the best in the world and Cavendish is a short drive for some amusement park fun! This cottage is a gem! cancelation policy is 60 days prior to arrival for full refund. We are strictly a non smoking house. Guests will be responsible for all smoke remediation costs.